Mark was our guide and very informative. He also took us to an area less crowded so we could see the Changing of the Guard it is not at the heart of Buckingham Palace - just FYI. Just be prepared to walk fast and a little ways to get there for that portion. You tour the Abbey first, then go to the Changing of the Guard. Overall, it was good. Our 9 and 13 year old got a little bored during the Abbey portion, but that is just age and less interest in historical info! Nice tour. Well done. Thoroughly enjoyed the tour guide. He was clear and very knowledgeable. We had a great tour of Westminster by Augusta August 2017 and she was very good in her knowledge of history, detail and a great tour guide! She knew a great viewing spot exactly where to go for changing of the guard and her timing was perfect so we can see it all. It was wonderful. The Westminster Abbey component was the only part of the trip that was value for money and worth doing. 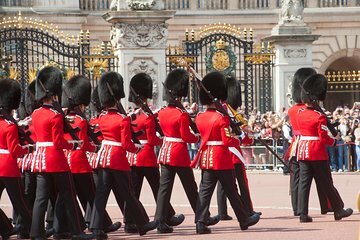 The changing of the guard was a mad dash to see the guards go back into the barracks. The changing all happened prior to us getting there. Guide was very knowledgable and personable. But the route and views that we were able to get weren't great and were disappointing for the money paid. If going again, I'd do this on my own. this was a wonderful , informative tour thanks to our guide Augusta Harris who was so informative with facts and side stories I didn't expect. she had very interesting facts and amusing stories that went with these facts as we all know history can sometimes be a little dry. Augusta was a fantastic guide. Very knowledgeable and entertaining to both my wife and our children. She has a passion for the subject and it is very engaging. Thank you again.